I am a Lecturer and Programme Director of the BA (Hons) in Communications in Creative Media in the Dundalk Institute of Technology. I teach a combination of practical and theoretical modules including web design, multimedia, mobile application development, graphic design, 3D modelling, and media studies theory (the social context of technology and the creative industries). My duties also include supervising practice-based research projects and dissertations and drafting programmatic review documentation. I did my PhD under the supervision of Scott McQuire and Nikos Papastergiadis in the School of Culture and Communications, University of Melbourne. My thesis is entitled 'Rethinking Urban Space Through Mediated Performance' and it investigates emerging patterns of social interaction in the contemporary mediated city through an analysis of participatory art performances. It includes field research on the work of British artist collective Blast Theory. In September 2009 I was awarded a MSc with Distinction in Interactive Digital Media from Trinity College, Dublin. I also hold a BA (Hons) 1:1 Degree in Digital Media, Design and Production from the Letterkenny Institute of Technology, Ireland and a BA in Architecture and City Planning from the University of Sao Paulo, Brazil. I have previous work experience as a web designer for London-based web design agencies and as a video producer and facilitator. As a freelancer I have produced commercial websites, the website for an academic journal and I have filmed and edited a documentary for the Earagail Arts Festival. My previous teaching experience includes the coordination of a major undergraduate subject (Net Communication) in the University of Melbourne for a cohort of two hundred and sixty students, where my duties included the preparation and delivery of lectures and tutorials, tutor coordination and student administration. I have also supervised final year group projects at Masters level in Trinity College Dublin that involved the development and delivery of mobile phone apps, interactive installations and web interfaces. My research interests include media and communication studies, new media, Internet studies, performative arts, interactive design, urban studies and science, technology and society studies (STS). Last Saturday I took part in the first ever Dublin Mini Maker Faire, an event hosted by the Science Gallery and Trinity College for crafters, tinkerers and hobbyists and displaying all sorts of DIY stuff. People from all ages and backgrounds were in attendance, and the organisers estimated that 6500 people visited the event, more than twice their predicted outcome. The event had an emphasis on engaging the public to participate, either through demonstrations or by getting people to produce things, from cardboard robots to electronic badges to music. I took part with a prototype of an Arduino project I’ve been working on, a Moveable DIY LED lamp, a.k.a. “Dynolamp’. It consisted of a very simple interaction, where motion and tilt combined changed the colour of a LED light on top of an animal-like structure with flexible legs, designed to be hung around different objects and surfaces. I added some TIC TAC boxes to add to the sensorial experience (sound and smell). Despite the simplicity of the project I was surprised by people’s interest, scrutinising my rough sketches and asking me all sorts of questions (what controls the light change, what are the TIC TAC boxes for, where is the power source…). I put a sign up encouraging people to pick it up and move it around, and was delighted to see many kids having a go at it, bending Dynolamp’s legs, tilting and shaking it and suggesting things (make it walk!). From 10am to 6pm I was flat out explaining Dynolamp to people from 3 to 80 years old. I took a break and got a volunteer to replace me for an hour. When I came back, the table was surrounded by people listening to an explanation given by volunteer Maurice. In the opposite corner of the room I was in, the NUI Maynooth crew was even busier, and their popular gesture-controlled giant Tetris game was a hit. It created an ad-hoc performative space where people surrounded the player and cheered them on as they played. It was great to see how a re-appropriation of a game considered banal and trivial was generating so much interest, including from kids that are so used to much more sophisticated games. I didn’t see a single person completing one round of the game, as the gesture controlled system was quite difficult. The NUI crew said they had to do some work on the code to make it smoother, but I think that by making it harder to control it actually created a more interesting challenge for people. They also had a DIY old-school arcade cabinet with several games from the 80s and 90s, and kids seem to enjoy playing Pac-Man, Space Invaders and other ‘oldies’. The Faire extended into the Trinity College Physics lawn, where, among other things, there was a giant drum that could be played by up to twenty people at the same time. It was a nice collaborative device, and I particularly liked the idea of having a dozen people in a circle performing on the same instrument. One guy seemed to be performing the role of percussion leader, and he got people to synchronise (to a certain degree) their drum playing. In several tents, kids were creating and playing with things. Among these: a giant scalectrix activated by the electricity generated by a participant using a gym walking machine; DIY remote controlled submersibles, and a class on soldering techniques. I’d Hide You by Blast Theory is described as an “online game of stealth and cunning” performed during the FutureEverything festival in Manchester during three evenings (17-19 May). It relies on live online broadcasting and consists of three teams of players competing against each other while running along the streets of Manchester. The players (or runners) don colourful brightly-lit helmets and a device consisting of a portable video camera with a ring of LED lights attached, making them very distinct. At the same time, anyone can join the game online by logging into the game’s website for a specific period of time and choosing a player. They can see the live video feedback of the player’s video camera. The objective of the street players is to covertly film players of the opponent teams. 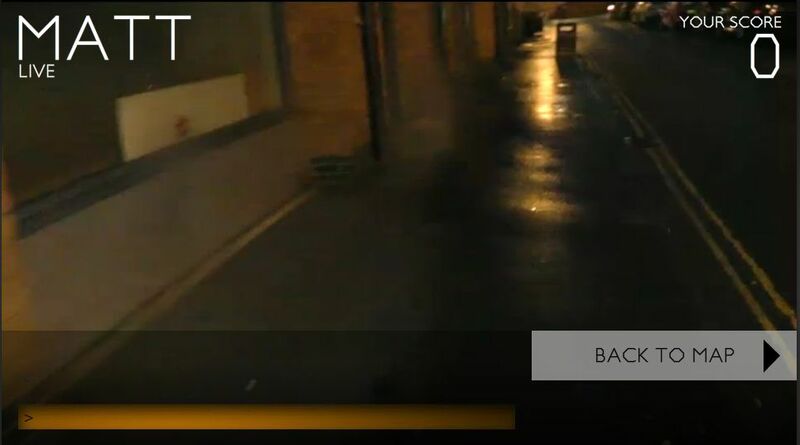 Once they have them in the sight of their cameras, the online players that have chosen their camera view click on the screen and score points, while the street player targeted loses lives. While many of Blast Theory’s projects participants assume the role of street players while the narrative is delivered to them through mobile devices, in I’d Hide You (and also previously in Can You See Me Now?) the roles are reversed: participants sit in front of the screen of their networked devices while the narrative is brought to them through a group of previously arranged street players (or runners). The latter are even given an online presence, where you can choose between red, yellow and white teams to see their self-descriptions and short videos. 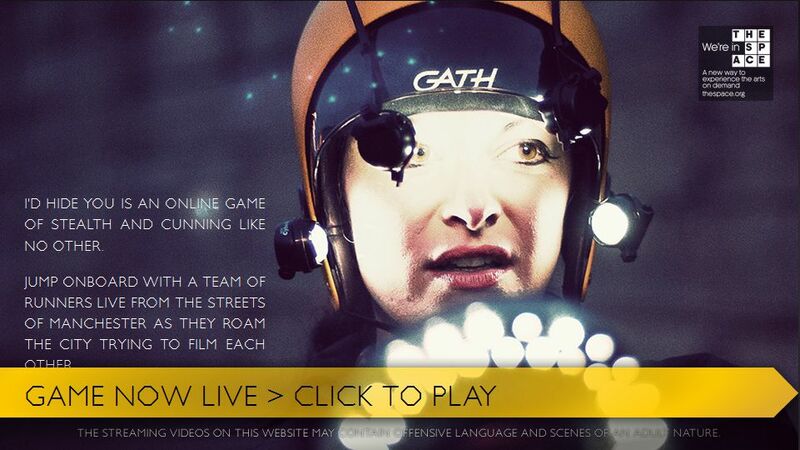 Another defining feature of I’d Hide You is the use of live online broadcasting, which, despite the advances of broadband technology, computer speed power and software, is still subject to glitches, breakdown, overloaded servers and variable image quality. This is perhaps why major broadcasters are reluctant to depend solely on it for transmission of major events. However, independent online broadcasting is undoubtedly a great playing field for experimental arts, and hopefuly we will see more of it in the near future. I logged in to the game’s website on the second day. The rules are simple enough to grasp while playing and the only action to score points is to click on the screen at the right time (when an opponent is in sight). I chose a player called Paul and his online video stream appeared in front of me. I was suddenly being taken around the streets of Manchester on a live tour. Paul kept turning around the camera to himself so he could chat while waiting to ambush other participants. He was quite skilfull at the latter, and once another player was on site I started clicking frantically on the screen, scoring nearly a dozen points (one for each click). The game goes on pause after the first seconds of a live confrontation because once the opponent realises he is being shot he turns around and the whole point of the ambush is gone. It then gives players time to move away and regain their breath before starting over again. While playing, I was able to send comments to Paul by typing on my keyboard (“Watch out, there is someone behind shooting at you!”). The experience of being ambushed is quite annoying. Paul got a bit distracted, was ambushed and lost all his lives. I join another player (Abi). She is too slow, and keeps getting killed. I get a bit annoyed, but unphased, I move on to join Matt, who seems more confident, assures me that he knows the streets of Manchester really well and that he is “in it to win it”. Matt is an efficient player, and I manage to add a few points to my tally while he ambushes a few players. Although my score keeps resetting to zero every time I switch players, I hope that somewhere in the server my score is increasing. However, after a while Matt gets into a cruisy mode and starts a kind of ad-hoc tour of Manchester’s night scene, entering a kebab shop and sitting down for a while, discussing the shop’s choice of music. He is stopped on the streets while people ask him what on earth he is doing. He dishes out cards with the web address of the game. Some peopl strike a conversation with him, holding hi back. I send Matt a message: “Come on, let’s keep going”.Other messages from online players also pop up on the screen (“There is another player behind you!”, “Good playing, Matt!”). For me, the most interesting aspects of the game are the amazing random camera shots and the random conversations that street players engage in. They keep me entertained for over an hour. The serer eventually crashes, it must be overloaded, and for me it’s time to get back to reality. Or to my closer reality at home. Thanks for Paul, Abi and Matt, I spent some time cruising the streets of Manchester alongside them with the excuse that I was playing an online competitive game to try and knock out the highest score (I was never going to do that and honestly did not aim for it). Like sandboxing in a walking version of Grand Theft Auto, except the scenery around me is not generated by algorithms. 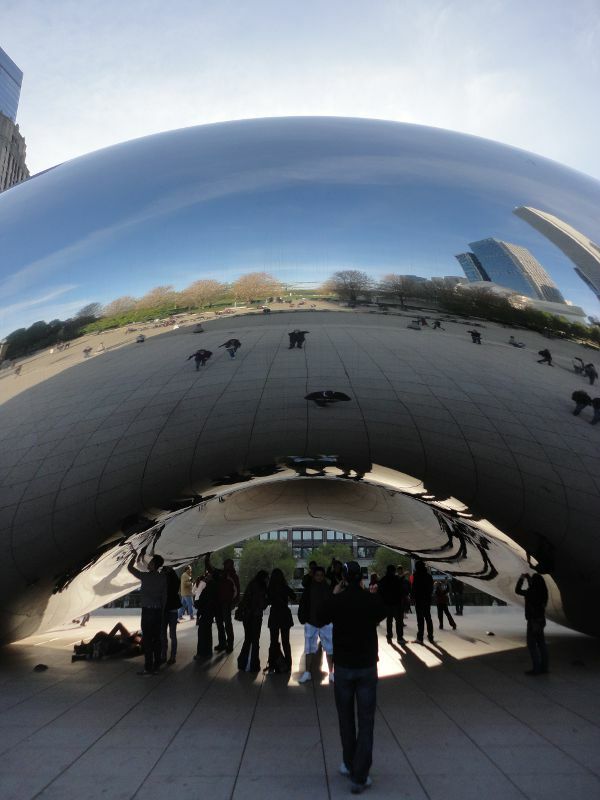 On a recent trip to Chicago I visited Anish Kapoor’s Cloud Gate, installed in the Millennium Park. Approaching it from Michigan Avenue is like encountering a mirage. Cloud Gate is as impressive as it is uncontainable and indescribable. Like a gigantic drop of shiny mercury fallen from the sky, its sensual shape evokes something that is constantly morphing, reaching for the sky while also firmly grounded. It is an alien structure, yet by reflecting back the surrounding city, it becomes immediately familiar to us. The terms ‘cloud’ and ‘gate’ evoke many things. It is a cloud that contains the sky, rather than being contained by it. In contrast with the dark, heavy and uncanny ‘data clouds’ that govern our mediated lives – clouds that attempt to transform us into pure information to be contained behind the closed gates of private data centres – Cloud Gate reflects back our desires, expressions and emotions to ourselves, passersby, and the city. As a gate, it does not create new spatial hierarchies. Rather than performing the role of a symbolically charged ceremonial gate – that eventually becomes detached from their original meaning and survive as an architectural curiosity – Cloud Gate invites the viewers to interpret it through their own subjectivities and to engage with it. It invites people to enter it, revealing its navel, a cave like space that catches visitors by surprise: a crescendo of darkness and distortion where the whole surroundings and everyone around seems to be swallowed up towards its apex. It is interesting to note that the first thing visitors do is to try and capture the sculpture on camera, attempting to register something that simply refuses to be captured in a two-dimensional canvas. 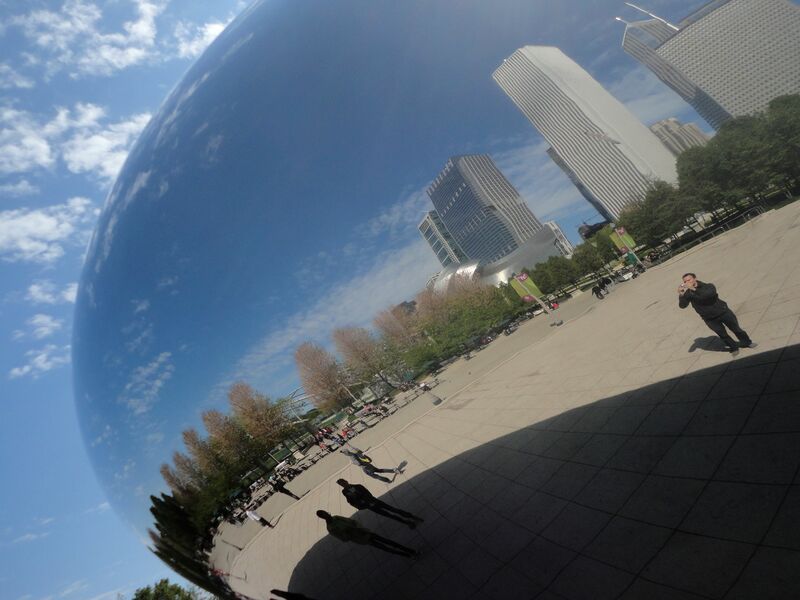 It feels like Cloud Gate is trying to capture you rather than allowing you to capture it and transform it into yet another nugget to be uploaded to some faraway ‘data cloud’ . Cloud Gate reserves its full experience to those that engage with it, joining it on stage rather than sitting in the audience. Despite the many times I read about it, and saw pictures of it, I was still in awe when encountering the real thing. The second thing that visitors do is to engage playfully with it: distorting their own images, lying on the ground to see the reflection of the city and passersby on its surface, touching it and trying to spot themselves as they walk near it. The lack of clear visual references, such as starting or ending point, actual height of the navel’s apex, location of your reflection – and sometimes, difficulty in determining where its edge stops and the real sky begins – lends an ethereal touch to the whole experience. My experience was like any other visitor’s. I walked around, took photos, tried to get different angles of the navel’s reflection by kneeling down and looking up, walked inside and through it to experience the differences in light and distortion. I amused myself at the reaction of other visitors and the lengths that people went to in order to capture it from a different angle. In the end I also sat back on a bench and, as a detached audience member, admired the slow movement of real clouds reflected on the upper part of its shiny, near-perfect surface. 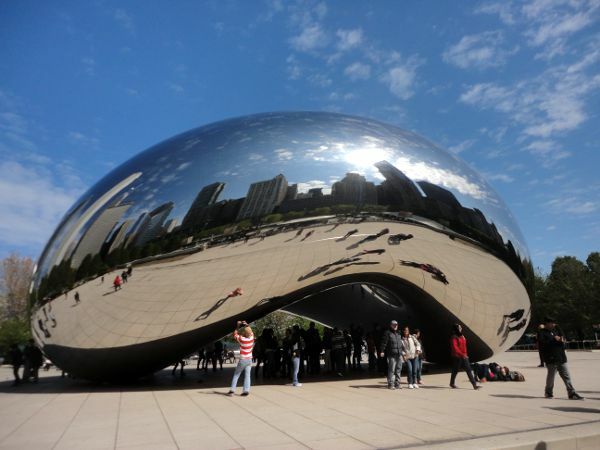 Cloud Gate is a testament to the power of simplicity and elegance. In our age of gratuitous spectacle, it reminds us that the best spectacle is the one that we provide to ourselves through interaction with our surrounding environment.